Well, this blog is off to a rip-roaring start, I've just won an amazing award from Booktrust! There are ten winners, and it was great to meet the rest of the Best New Illustrators gang, and toast our victory! Here is the list, so many amazing illustrators, the future looks very bright. I also love Anthony Browne's wonderful narration on The Guardian. Worth a look/listen. 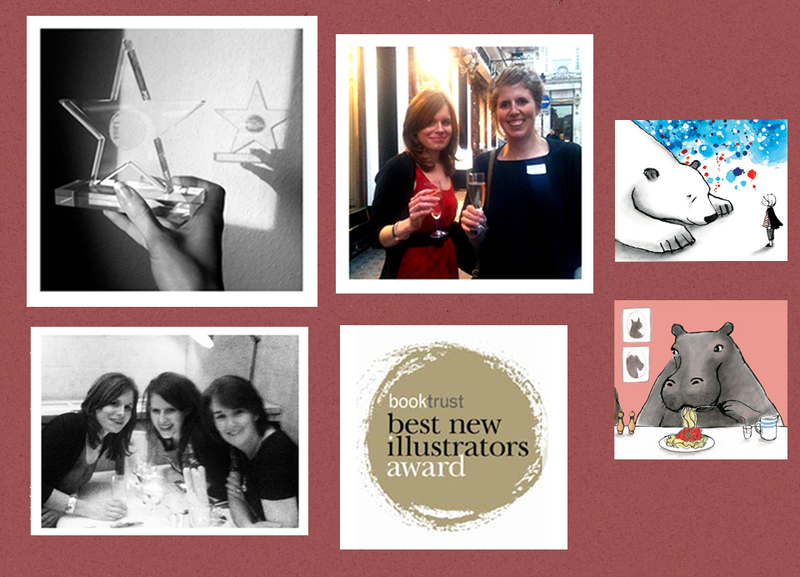 The award announcement was at the Illustration Cupboard in London, and it was a lively, fun and celebratory affair. There are lots of pictures to come of the night, but for now I only have these low quality pictures that were quickly taken. The picture top left is of the lovely Claudia Boldt, and me. The other is of me, Andrea MacDonald and Sue Buswell (from Random House) at my fantastic surprise dinner.